Our Services — Gutter Pro Exteriors Inc.
Fascia gutter, also known as eavestrough, is a trough that is attached to the eaves of the roof. This essential component not only adds a finishing touch to the homes exterior but helps protect it from water damage. On an average home in Kelowna 57,000L of water runs off the roof every year. Left uncollected and redirected this water can cause serious damage to the roof, siding, foundation, and landscaping. Our 5" continuous aluminum fascia gutters are extruded on site according to the homes unique specifications, greatly reducing the risk of water damage from roof runoff. Made from aluminum with a baked on enamel finish available in an array of colours and backed by Gentek's 40 year aluminum warranty you can be sure of long lasting beauty and durability. Half-round euro gutters take an old world approach to water management for a timeless look. Imported from Europe, these gutters are installed in 10 foot sections with matching decorative hangers and gasket fittings for a water tight seal. Available in copper, zinc, galvanized steel and powder coated steel. Have a look in our gallery for more examples of this unique gutter system. Keeping the gutter and down pipe free from debris is essential to ensure their proper function. Having the gutters cleaned out each Spring and Fall is recommended. Leaf guard can greatly reduce the frequency and difficulty of needed cleaning. With new gutter installations Alu-rex's T-Rex not only keeps leaves out but has the added benefit of a continuous fastening system that adds strength. For existing gutters Alu-rex's Gutter Clean System can be added to keep gutters free of debris. For information on the Alu-rex leaf guard systems please visit: www.alu-rex.com . Don't want to install leaf guard but want to keep debris from clogging up ground drains? Ask us about leaf catcher boxes that install directly on your down pipe, a low cost alternative to a full leaf guard system and a must have for homes with ground drain systems. This aluminum cladding attached to the outer face of wood fascia boards not only protects them from weathering, but eliminates the need for painting or staining. The maintenance free baked on paint finish continues to look good year after year, even wood purists have trouble ignoring the advantages. Available in a wide range of colours. 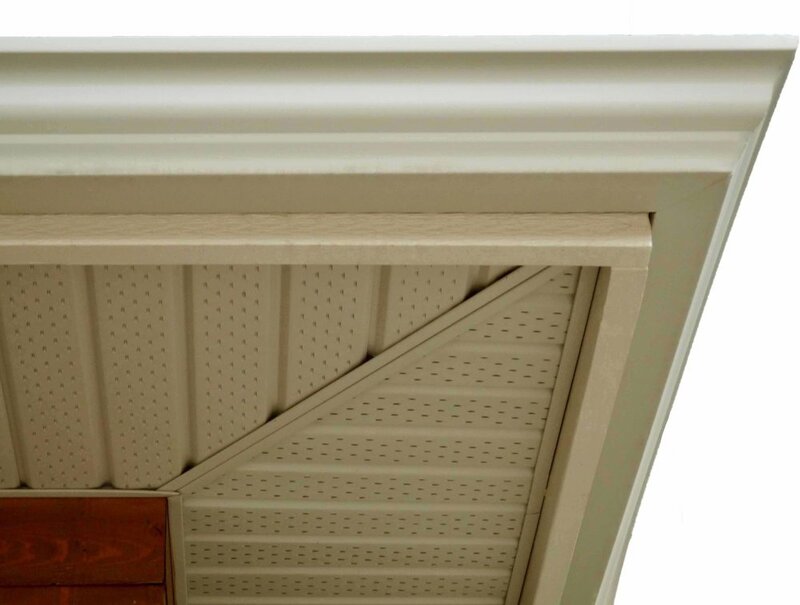 Vented aluminum soffit finishes off the underside of the roof overhang providing essential ventilation and air circulation to the roof structure, while keeping unwanted critters out of your attic. Made from quality aluminum coated in a long lasting maintenance free baked on paint finish available in a wide range of colours. Just how much water runs off a home's roof every year? On the average home in Kelowna more water runs of off its roof (57,000 L) than a family of four uses outdoors (40,734 L). Rain water harvesting can reduce the impact we have on municipal supplies, help reduce greenhouse emissions, and reduce the risk of storm drain back ups - all while lowering water bills. Rainwater harvesting just makes sense.